Saraab in Urdu means mirage or illusion while a similar sounding sharaab in Hindi stands for alcohol. Modi said saraab is harmful for health of Uttar Pradesh. 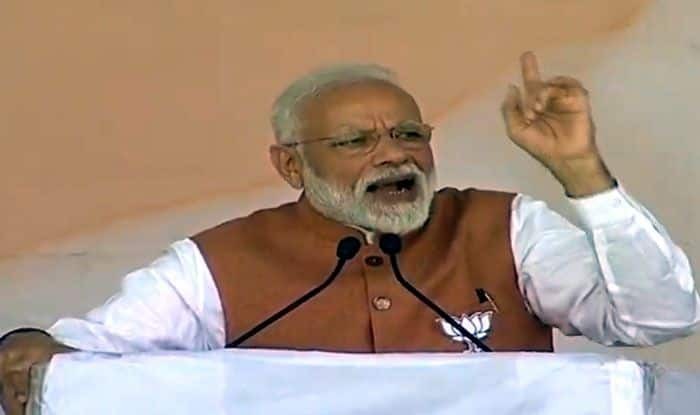 Prime Minister Narendra Modi on Thursday dubbed the alliance of the Samajwadi Party (SP), Rashtriya Lok Dal (RLD) and Bahujan Samaj Party (BSP) in Uttar Pradesh as ‘saraab’, saying it is harmful for one’s health and the state. The Congress and the Samajwadi Party promptly slammed the Prime Minister for likening the opposition parties with liquor. ‘Saraab’ in Urdu means mirage or illusion while a similar sounding ‘sharaab’ in Hindi stands for alcohol. “Sapa (SP) ka ‘sa’, Ralod (RLD) ka ‘raa’ aur Baspa (BSP) ka ‘ba’, matlab ‘saraab’. SP, RLD, BSP, ye saraab aapko barbaad kar degi,” Modi told a Lok Sabha election rally here in Hindi. He said “saraab” was harmful for one’s health and also unhealthy for the health of Uttar Pradesh and the country. Former Uttar Pradesh Chief Minister Akhilesh Yadav said despite being in power for five years, Modi was again providing illusions to the electorate. “Today the tele-prompter has revealed that the people who encourage the intoxication of hatred do not know the difference between ‘saraab’ and ‘sharaab’,” Akhilesh Yadav tweeted. “Now, when new elections are approaching, they are showing new illusions,” he said. The Congress was more scathing: “Does this kind of talk befit a Prime Minister? You are calling three political parties sharaab? Is this the way a Prime Minister talks? Can people accept this,” Congress spokesperson Randeep Singh Surjewala said in New Delhi.